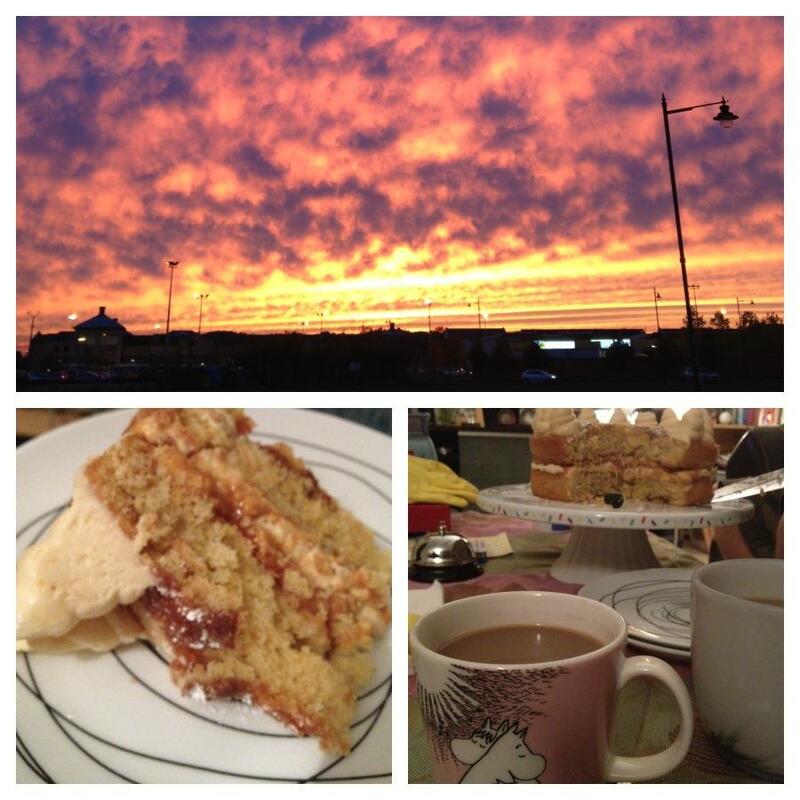 This blog contains a theme of an adult nature – So as not to offend! Before you read this “How To” guide, I want you to get into the mood, check out my Spotify account with my very own “Breaking Bad” playlist to get you in the right mindset. What is “Breaking Bad” I hear you ask? It’s a TV series about a Chemistry teacher who is diagnosed with terminal cancer, so he quits his job (in awesome style I might add!) and decides to team up with an unlikely partner in an ex student (a low life who will surprise you as a viewer, without giving away too much!) 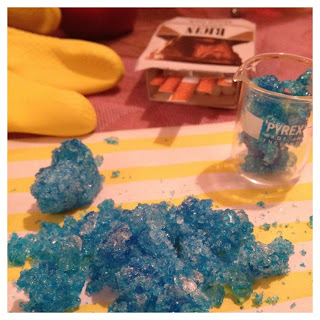 to cook up Crystal Meth (yep, this isn’t my normal afternoon tea ramblings, no apologies provided, I like to get my geek on from time to time!) which will support his family financially once he pops his clogs – That pretty much sums the story line up without spoiling it! Of course, along the way, he gets into all sorts of japes and bants with drug lords, his family, police and even a local fried chicken restaurant owner. I can’t tell you any more than this, you have to get addicted to this like we did to find out more – it’s sheer brilliance. 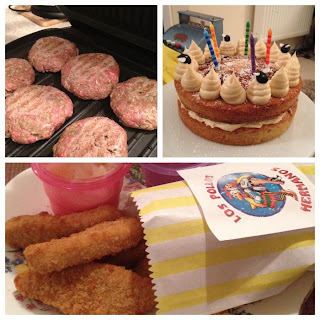 were so many food ideas, both for a “TV Party” with friends, but also as a tea party, so I was in my element planing & plotting a secret themed party for this evening. was at the time that we were well on our way to finishing our Season 4 Box Set of the hit TV Show “Breaking Bad” – So it seemed right! And he LOVED it just as much as I loved plotting it. How to throw a Breaking Bad themed tea party. These are simply my thoughts on how to do this… but make it work for you and more importantly, have fun with it! Once you have your music on, guests are invited and you have a stress on to get creative, start with the basics. 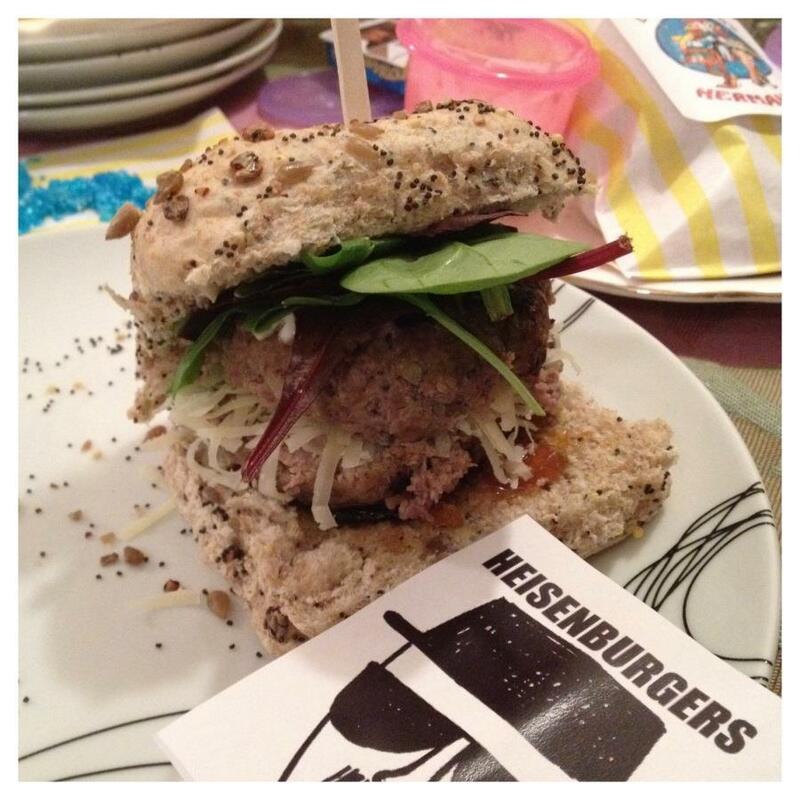 What food can you bring from the show to your table? the Lean, Mean Grill to drain the fat. I served these with seeded rolls and a stake through the burger with a “Heisenburg” cartoon sign on them for comical effect. They were easy and great fun on the table! I made my fave Chicken Goujon recipe, served with ketchup as well as making up a sweet chilli dip with mayo & sweet chilli sauce, placing the dip in cute little baby food containers to bring in the “baby” element of the show to my table. I labelled up my chicken bags with the “Los Pollos Hermanos” logo and just dreamt that Gus himself was there serving us, a girl can dream! I also had Cheesy Puffs (couldn’t get Cheetos in my local supermarket!) on the table for nibbles, in honour of Jesse’s fave snack! 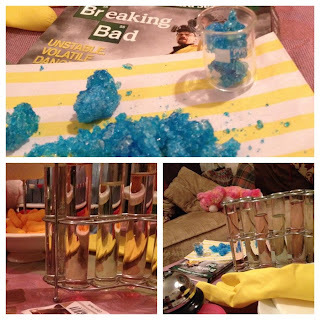 As well as cooking up my own edible Crystal Meth, which I placed in little pyrex beakers as an ode to Walt and his crazy lab, I surrounded it with “Breaking Bad” style paraphernalia such as yellow gloves, Hector’s bell and a pink teddy bear. I tried to blowtorch the bear to get the desired effect (again, watch the series ; p ) but it didn’t work this time! I told you… unless you have watched this show, none of this will make much sense! Although I hope you enjoy this all the same hehe. Drinks were various coloured vodka shots, poured into test tubes for my lab-esque table. 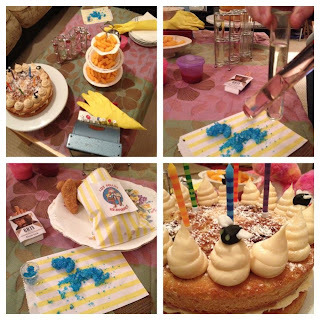 No “Breaking Bad” party is complete without a bevvie or two, so we toasted the birthday celebrations in true BB style. you go the whole hog – boiler suit an’ all! 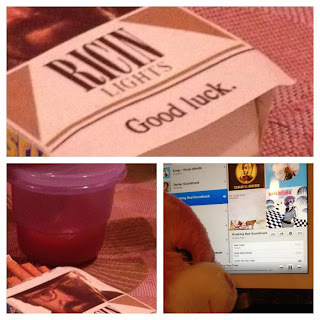 As decoration for this table, there needed to be a few odes to this series, one of which was a pack of faux smokes with a picture of walt and a nod to Ricin. I’d also added my vintage till to the table, as a nod to the superb resignation scene in the car wash… I couldn’t resist! I couldn’t resist adding the fly to the table. 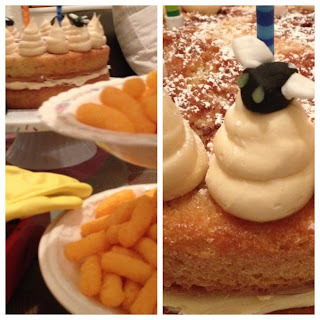 Walt becomes obsessed with one in an episode during season 3 and I won’t ruin it for you, but I had to make a cake with flies adorning it, as no party is fit for purpose without cake… naturally. I made a vanilla & caramel layer cake with sugar paste flies to sit on the buttercream swirls on the very top of the cake, it got the right geeky laughs, so it worked well, hurrah. This, washed down with a cup of strong coffee after our meal was the perfect way to end the party, snoozing around the table as we did – the old timers that we are! The sunset over Cambridge on this evening was also one to rival any sunset seen in the Mexican Desert!… It couldn’t have made for a more perfect setting for the event, it’s rare to see a sight so beautiful in this region, so what a treat in itself. I had originally wanted to host this as a *Civilised* afternoon tea, however it didn’t work time wise on this occasion. 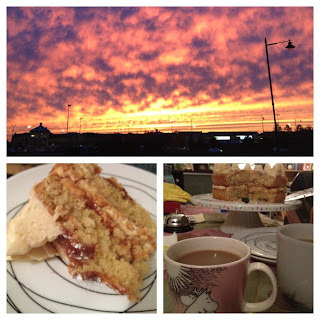 If I were to do this again in the future, I would include Jam and peanut butter sandwich, crusts off – It wouldn’t be an afternoon tea without them! Perhaps even a pancake stack for breakfast, Walt Junior wouldn’t have a birthday treat any other way! Or how about purple cupcakes as a tip of the hat to Marie, the purple-loving, tiara stealing sister in law – she’s my fave BB woman! I also love the fact that Aaron Paul (Jesse) and Bryan Cranston (Walt) are notorious for going a bit crazy when it comes to the wrap parties at the end of filming each series… they have been known as dressing up as each other, as well as other characters, such as Skyler and Jane (their better halves throughout the series) on one occasion – I just love this and can imagine people throwing their own parties and going just as weird in their dress sense – if you do, send me pictures haha, would love to see them! Are you a big fan of “Breaking Bad” too? 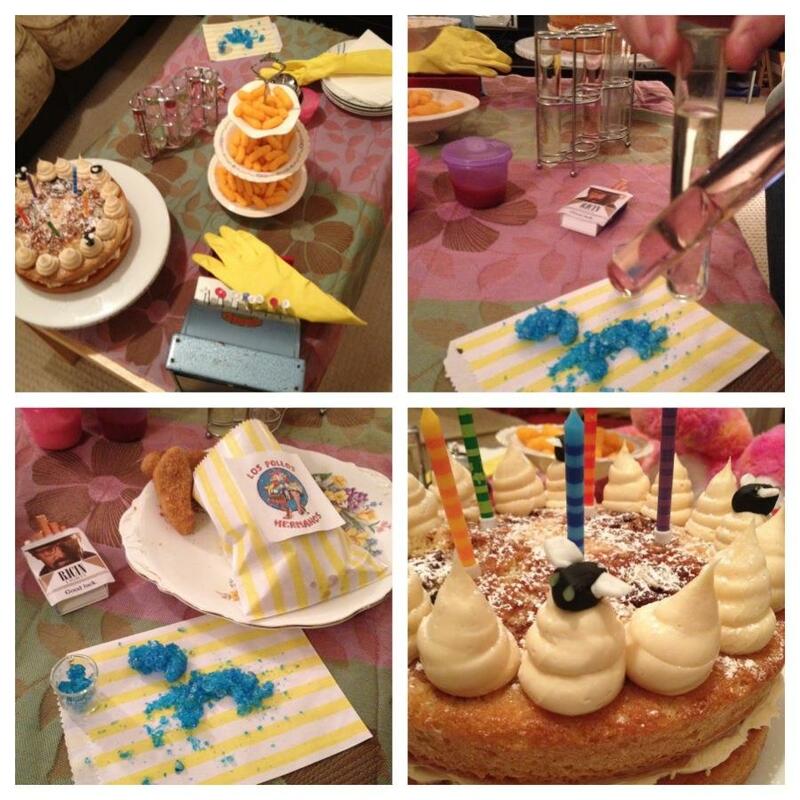 – Do share your own BB party ideas in a comment below! PS – You can see my full Facebook Photo Album for this event here. For the season premiere this year, we had a small party, complete with sheets of rock candy, which we each broke, that was some good stuff. I flavored it with banana, rootbeer and blueberry. It was a hit. For the season finale,I am doing it ALL. 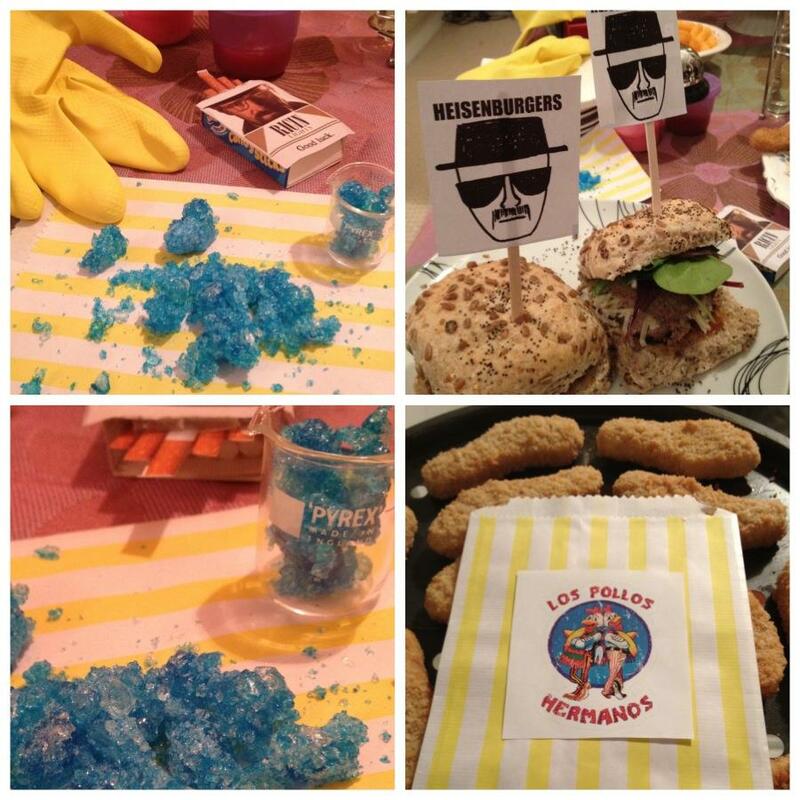 From Marie’s purple decor to Heisenburgers, los pollos hermanos chicken and fries, to gatorade and cheetos. We will be ending this season full and satisifed with food, and weak hearts because the show is over. 🙁 Here’s to our BB peeps!